Bottled water delivery from Culligan of Central Coast is perfect for the office, and is great for your home too! With bottled water from Culligan you can choose the type of water you want whether it’s reverse osmosis filtered water, demineralized water or distilled water. At Culligan of Central Coast we have a bottled water plan for every budget and every need. Bottled water delivery has never been easier or more hassle free than with Culligan of Central Coast. 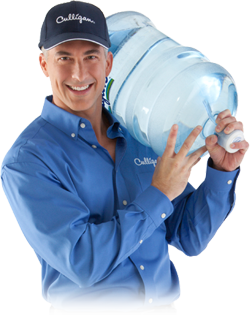 Your Central Coast Culligan Man will deliver your water right to your door and then remove your empty bottles. All of this is done at a time that is conducive to your schedule. Give Culligan of Central Coast a call today to discuss our bottled water plans and see which one is right for you OR order bottled water online!